Spring Break is finally here and I couldn’t be more relieved. I originally had plans to go to the beach for a few days but things came up and I’m happy to spend the week in Atlanta, starting with a great weekend at home with my parents. We went to Negril Village on Saturday night and had a huge, delicious dinner. Unfortunately the food doesn’t photograph well in such low light, so I can’t share what we ate. I hope this picture of me and my mom will suffice. Chances are I’ll be back there for brunch soon and will be able to show you how great this place is. On Sunday we got up fairly early and went to Another Broken Egg for a similarly huge breakfast. All of my pictures were on Snapchat and unfortunately I forgot to save them, but this place is GOOD. Get one of the scrambles with potatoes or the French Toast. 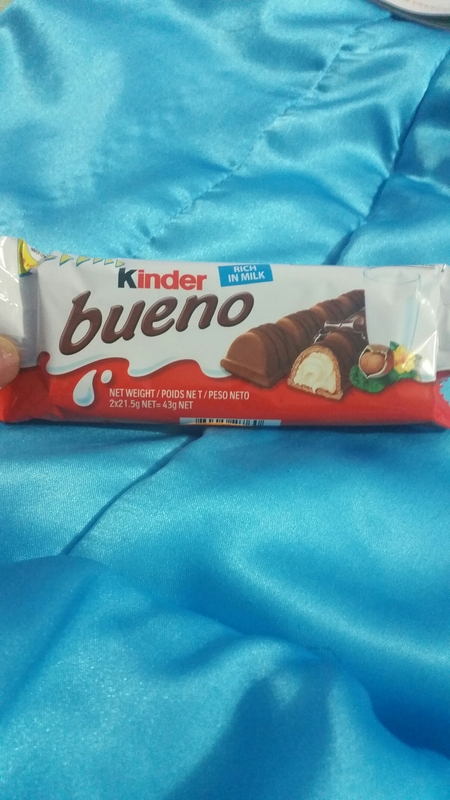 Afterwards we shopped (I’ll do a haul/lookbook later) and hit the farmer’s market, where I found my favorite candy! I haven’t had one of these since my trip to Switzerland almost three years ago (which you can read about here, if you want). Once Easter arrives and I can eat chocolate again, I plan to incorporate these into some delicious recipe….or just pig out on the bars alone. A win either way. Thennn we came home, I applied for a few more internships and then I helped my mom make a pretty good Caribbean seafood dinner. My contribution? 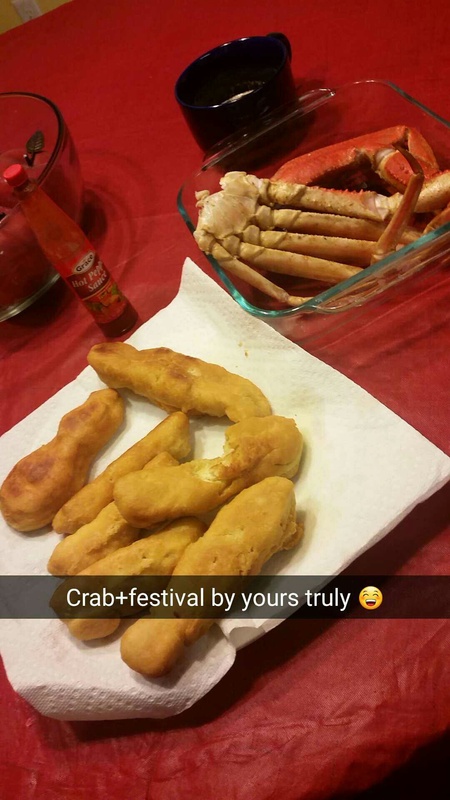 Crab legs and festival. Not pictured is my mom’s amazing fried fish. Right now I’m watching Marie Antoinette while my hair is deep conditioning and gearing up for another day at work tomorrow. I feel so relaxed and I can’t wait to see what the rest of this week has in store. Every night before bed, I make some tea and write in my journal. I look in the mirror and remind myself of something good I did that day, and a challenge I overcame. I think of three things I love about myself. And sometimes I do squats, and then it’s off to bed. I had a weird phase when I just didn’t like normal bacon; I thought it was too fatty. My mom got tired of me picking all the fat off my bacon, so for a few years I switched to turkey bacon almost completely. I’ve gone back to the good side since I came to college, but I don’t mind turkey bacon from time to time. Most people know that I love dogs and I want a dog as soon as I get the chance (which isn’t that far off, really), but not a lot of people know that I really like pitbulls. They’re so sweet, loyal, and smart, and with the right kind of care they can make the perfect pets. So when it comes time for me to rescue my first dog (because why buy when there are so many in shelters? ), chances are it’ll be a pitbull. Just look at that little face! I really love all things vanilla. Candles, lotions, ice cream, perfume, this iced latte I’m currently drinking…it’s my favorite. Peppermint is a close second. Spartacus (on Netflix) is my guilty pleasure. I’ve seen all four seasons backwards and forwards, and I just can’t get enough of it. I’m considering a career in food writing, but I don’t like certain foods that a lot of foodies like: fancy cheeses, oysters/clams (can’t stand them), unnecessarily expensive meat. Just give me a good burger or pizza and I’m set! I have this habit of listening to songs/albums on repeat for hours. Or days. And I never get sick of them. Right now, I’m giving up chocolate and fries. Other than a granola bar last week, I’ve been good so far. It’s done wonders for my skin and this may have to be a permanent thing (or I’ll finally get that whole “moderation” thing that everyone keeps talking about). I’ve followed this one blogger, The Londoner, for almost five years. And when I say follow, I mean I’ve checked her blog every day for new posts and have spent countless hours browsing old ones. She was the first person who inspired me to blog and while I don’t have any desire to work in PR, move to London, and adopt a fluffy Morkie marshmallow and name it Custard (okay, maybe that last part isn’t true), she definitely has some aspects of the life I want. This year I’m making more conscious decisions about where I shop and trying my best to support Black businesses. This isn’t always easy for clothes, but I’ve found some great restaurants, accessories, and hair and skin products/lines that I really like! Once upon a time (senior year of high school) I took an amazing beginner’s photography class. I loved being the master of the entire process, from finding subjects and developing B&W film to making prints and framing them in a gallery. Since I started so late I wasn’t able to advance to color film or a digital class. I love my digital camera but over spring break I plan on digging up my film camera and getting back to that passion. I really want to try vlogging this year, at least once or twice. Just another step towards getting comfortable in front of a camera. People think my mom is my sister quite often, and this week my dad and I were asked if we were siblings. I’m not mad, because Black don’t crack. It’s like looking at my future. I wanted to treat my eyes to something special. Between classes, my internship, and my own personal leisure time, I’ve spent countless hours staring at screens this semester. I also hadn’t left the Emory bubble for anything except work since Winter Break. So with a rare free afternoon, I decided to finally put my membership to the High Museum to good use. I love all of the natural light that fills the space. I also love that it is an enormous building. Four floors with countless wings and alcoves, all filled with incredible art. My journey to the top was filled with beautiful marble pieces. I love the attention to detail in this one, down to the sockless foot. I took my time in the American art galleries, listening to music at first but then decided to enjoy the comfortable silence. You seem to travel through time as you make your way up to the top, with brighter pops of color and more contemporary shapes and mediums lining the way. Another personal favorite, especially the pops of color! I fell in love with several pieces on the top floor, and most of them were in one particular gallery. Tiniest doors I’ve seen in a while. They come up to my waist. I wonder if they go to a magical realm or something. The visual effects had my head spinning for a minute. I absolutely love this piece and I promise to get a good picture of the whole thing when I go back! Some of the pieces made me laugh. But all of them made me smile. I just sat there for a while, taking it all in. The longer I stayed and the more I saw, the better I felt. With my batteries recharged, I set out to leave and a mannequin caught my eye. Encouraged by a strong, cold wind, I headed into another section of the museum. Iris Van Herpen has an exhibit with some of the most stunning pieces I’ve ever seen. This looks like it might be uncomfortable and definitely not my size, but I would love to wear it. I walked through all three floors, quietly fangirling, and finally dragged myself back into the cold. “I could definitely live here.” I thought. Chances are the High Museum isn’t renting out residential space anytime soon, but maybe I should inquire about this little cottage on the outskirts? All in all, it was a great way to spend Galentine’s Day. Adj. Having no knowledge, understanding, or ability. Some prominent Black actors are debating the need for a boycott of the Academy Awards after no Black actors or actresses were nominated for many of this year’s categories, including Best Actor/Actress and Best Supporting Actor/Actress. While Jada Pinkett-Smith and Janet Hubert were going back and forth about this issue, Stacey Dash decided to throw in her two cents on the debate. In a segment on Fox News, she argued not only that a boycott of the Oscar’s would be “ludicrous”, she also stated that “..we need to get rid of channels like BET and the BET awards” in order to get rid of segregation. To top it off, Dash also stated that we need to get rid of Black History Month. As many of my professors would say, let’s unpack this. Dash believes that having awards ceremonies solely dedicated to Black artists is segregation. The fact is that ceremonies such as the Image Awards and the NAACP awards, and channels like BET, came about because Black actors and artists were not being represented and recognized in spaces that were supposed to be integrated. Black artists noticed this, and to compensate for the lack of representation and the denial of the recognition of excellence that came from Black films and Black works, they made their own. Moving on, let’s dispel the notion that racism will magically disappear if we get rid of Black spaces or anything that specifically highlights Blackness. I repeat, getting rid of ceremonies that celebrate Black work and Black talent will not get rid of racism. To think otherwise is to be unobservant of the dynamics of the entertainment industry. The Academy is not going to suddenly work harder to nominate Black actors and actresses for awards if the Oscar’s are suddenly the only awards show we can participate in. Black artists will have to work even harder to receive any recognition and exposure, and even then there is no guarantee as to whether or not they will receive it. Black awards shows deserve their place in media just as much as predominantly White ones. If Black excellence is not being celebrated at the Oscars, we have every right to bask in it at the Image Awards. Same with BET, the NAACP, and any other organization that wants to uplift and recognize Black artists doing great work in an industry that still presents so many obstacles to their success. And as for Black History Month, that is staying. It is crucial for everyone to learn this history and it clearly isn’t being taught well enough in the other eleven months of the year. So for the sake of pursuing a better education, I’m just going to say a flat-out “nah” to that claim. *sigh* Celebrities really are wild nowadays. LADIES: It is our year to be the time wasters. Men have been the time wasters since creation. Join me in my solitude and #WasteHisTime2016. I really thought pettiness would take a short vacation after the new year, but I was mistaken. Silly me, I know. Just when I caught my breath from the #NewYearNewMe tweets that flooded my TL and soon-to-be-broken resolutions on Facebook and Instagram, a fresh wave of pettiness came in the form of #WasteHisTime2016. Before I say anything else, I want everyone to know how much I love Black Twitter. I think it’s incredible that so many people who have never met can bond over shared experiences so unique to us. We broke the internet over Christmas, Thanksgiving, for the Oscars, and on random days just because we wanted to talk about growing up Black and being Black on campus. Not to mention #MelaninOnFleek and #FlexinMyComplexion. I could go on, but you get the idea. It’s lit. And 2016 is no exception. From the very beginning, I was here for this. The shade, the sarcasm, the clapbacks, all of it. This, to me, is yet another way I can bond with people I’ve never met over shared experiences. I scrolled through every chance I got, thinking “You too, girl?” with many tweets and crying real tears over others. I laughed so hard because some of these situations had happened to me and my friends down to the letter. I finally knew that no, it’s not just me. With some tweets I could think of at least five guys who fit the description. As with anything that women do, especially Black women, there were some haters. The Boys of Twitter fired back with #WasteHerTime2016 almost immediately. So when men say the #WasteHisTime2016 is why women don’t have a man I think they’ve missed the point. These are the things men do to women. Ah, the fragility of the male ego. It’s a wonder. So many men got hurt and offended by this trend when really…it was literally us pretending to be them. Same behavior, same dialogue, everything. And some of them, and even some women, were maaaad. This amuses me for a few reasons. Some men actually do believe that every woman who uses that hashtag will actually set out to waste some poor man’s time. They really do think we’re all that vindictive. The best clapback some of these dudes can come up with is “Keep it up and you’ll be single for Valentine’s Day.” This just means I won’t have to share my chocolate with anyone, so honestly I’m not pressed. Thankfully, some men get the point of the hashtag. After reading the tweets with the hashtag #WasteHisTime2016, I ain’t realize how much hurt we put you ladies through. I’m Sorry. Some argue that petty actions like this are what’s wrong with our generation and will keep us from finding love in the future. Do I think it’s true? Maybe. Am I still here for this trend? Absolutely. And if means that some guys get their feelings hurt after getting a taste of their own medicine, then that’s fine too. After all, change doesn’t come from a place of comfort. The bar has been set pretty high for the year in less than ten days. I can’t wait to see what’s next. I didn’t quite make it to Harvard, but my time in this charming city was pretty satisfying. Mom and I arrived mere hours before Christmas and spent a few days exploring and relaxing with family. The Atlanta heat decided to tag along with us and Christmas day was rather warm, but it made taking pictures in the park at night a lot easier. Remember when I said that I would do some bad eating over break? I achieved that goal in Boston. Plenty of pizza… sweet desserts… and pretty coffee! I’m a sucker for latte art. Not pictured: enough eggnog and junk food to last me until next Christmas. I forgot how much I missed Oreos. We made the most of sunny days and worked our way around the city. Mom and I braved the 30 degree weather to visit Boston University. This was one of those sobering, oh-wow-I’m-actually-going-to-be-a-real-adult-soon moments. Armed with a cup of coffee and my mom’s sound advice, I considered what Boston life would be like. Easy summers, more people, winters that were less bitter than I expected but still a big change for a Georgia peach like me. I’m sure that life will lead me to a big city one day, so could I see Boston as home? In the downtime and on rainy/snowy days, we watched movies on the couch all cozy and warm. My favorite way to spend a lazy day, with some of my favorite people. I think I could learn to like Boston, if that’s where I’m destined to go one day. I can’t wait to go back! What did you get up to over the holidays? At 12:06am, sitting on my couch with Chinese takeout and a glass of sparkling cider in hand, I had no idea how right my prediction would be. My goals were to make it through my science classes (one lab at a time), keep pushing towards vet school, get a job, and to ultimately survive. The same goals as a lot of bio majors, really. I certainly wasn’t thinking “New year, new me.” I was just trying to be myself. 2015 was an extremely transformative year for me. I changed my major and my career track, met some amazing people, and explored new places. Most of all, I spent a lot of time relearning what I love and what makes me happy. My GPA rose, my hair grew (and grows longer still! ), and I had some “Holy crap is this adulthood?” moments that I’m sure I’ll laugh about later on. And I made it through 2015 with very few L’s. Overall, I’m pleased. I can’t say that my motto for 2016 is “New year, new me.” I’m still me. But the changes I made in 2015 have helped me learn more about myself. I spent most of 2015 throwing myself blindly into new things and hoping that the decisions I made were the right ones. I think that I can go into 2016 with more confidence, wisdom, and enthusiasm, as well as less worry. I think the way I brought in 2016 was a sign of the good times to come. Up until this year, I’ve spent every New Year’s Eve at home with my family. We brought in the new year quietly and with a lot of reflection and promises. Last night I watched the Peach drop downtown for the first time. I spent time with old friends and made some new ones, laughed all night, and fell asleep around 6am ready for more adventures. After a huge breakfast at The Original Pancake House (which I wrote about here) and a sufficient food coma, I feel rested and restored. I can’t wait to do it all again next time, except with a real champagne toast. Here’s to a hell of a new year. After many coffee-fueled nights, too-early mornings, and a lot of writing, I’m finally on break. I’ve taken a few days to get my mind right and to adjust to being home, and now I’m back on the blog. Instead of assuming the role of Couch Potato for the week like I always do, I’m slowly and surely getting my life together. The past few days have included baking rum cake with my mom (recipe to come soon! ), making a much-needed hair appointment, and getting Christmas gifts for my loved ones. Oh, and lots of sleeping in. The trunks under my eyes have shrunken to their appropriate carry-on size. So what have I been up to in the past few months? Basically a little bit of everything. I took a bunch of writing-intensive classes, finished my language requirement, and an African dance class. I joined the staff of Black Star Magazine as an editor and assumed the role of Music Director of my a cappella group. In my spare time, I applied to dozens of internships. My semester was heavily driven by deadlines and I don’t think I had an extended period of down time between early October and last week. But I can say with pride that I made it through these last few months with good grades, a new internship for a great magazine, and my sanity! I got to have more time for fun than I thought I would. My schedule was hectic at times, but I still found time for Netflix, lots of surprise brunches, parties and movie nights with my friends, and even a few concerts. I never got to see Pentatonix (I vow to see them before I graduate) but I did get to see Lianne La Havas and she was incredible. I had enough coffee, pancakes, and fried food during finals week to last me a month or two, at least. I’ve been good to my body since I got home, though; avocado with whole wheat bagels for breakfast, lots of fruit during the day, and veggie packed dinners at night. But you know me. I’ll find a way to pack in some indulgences over break. A friend got me hooked on eggs benedict and I’m craving some chorizo and salted caramel gelato. I’ll definitely get more sleep. And if I get to have any adventures over break, I’ll be sure to share them on this blog. I’m a huge supporter of retail therapy, especially online retail therapy. Holiday shopping in person is great and I love certain aspects of it: the crowds (to a point), the thrill of finding that last perfect shirt in my size and preferred color, the decorations, and especially trying on clothes before I leave the store and knowing that things fit well. But as nice as all of these things are, I am still the worst shopper. My feet ache from long lines, my arms hurt thanks to all the bags I end up with, mall food is more expensive and not that great, and as much as I love kids they get on my nerves after the tenth crying baby. So when I was at home on Black Friday, snuggled under my covers and working on a long paper due that weekend, I happily partook in Black Friday shopping for the first time. Instead of flocking to the big brands, I did some digging and found some great Black-owned businesses to support. For every few pages that I completed on my paper, I bought something new. I was able to get a pair of shoes, a ton of makeup, and my mom’s Christmas present. And most importantly, I got this pretty little thing! This bag is from Double Clutched. I was looking for a statement piece, nothing too big but something that could hold all of my essentials. I absolutely love the designs and I’ll probably buy another one or two clutches from this collection. The brand also has wristlets, wallets, tote-sized bags, and more. I may have overestimated the size of the clutch, but I still really like it and I know I’ll get my money’s worth from this bag. I plan to do the rest of my holiday shopping with other Black-owned businesses as the holidays progress and I take study breaks during finals. I’ve got my eye on some shea butter from BGLH (how can I possibly turn down whipped vanilla scented goodness? ), for myself and as stocking stuffers. Do you have any suggestions for great products/stores for men? I’m looking for a gift for my dad. Let me know! Like Nigra Sum on Facebook! Enter your email address to follow Nigra Sum and receive notifications of new posts by email.